Figure 1: PC/104’s rugged and modular architecture allows developers to add functionality by merely adding a board to the stack (Source: PC/104 and Small Form Factors). Figure 2: The PC/104 family of specifications has provided a steppingstone to higher-performance embedded systems since 1987. Now, it is enabling these systems to transition to IIoT (Source: PC/104 Consortium). The progression of PC/104 technology also coincides with rising bandwidth requirements in industrial systems, which now employ multicore systems-on-chip (SoCs) to support additional sensors and connectivity as part of the IIoT infrastructure. For designers looking to scale existing designs to support these capabilities, PC/104-Plus and PCI/104-Express provide the ideal bridge technology. PCI/104-Express, for example, supports not only PCIe, but high-speed interfaces like USB, SATA, and Gigabit Ethernet (GbE) as well. These interfaces, along with a higher level of signal integrity in the PCI/104-Express specification, ease integration of next-generation I/O peripherals and eliminate the need for reengineering when adding modules to the stack. Additionally, with PC/104-compatible peripheral modules for almost any required capability, designers can move quickly from industrial to IIoT. The ability to add functionality by stacking peripheral modules on top of a processor baseboard has helped PC/104 maintain its popularity over the years. In addition to providing a platform for new technologies, corner-mounting holes and stack-through connectors on each board – excepting the base – mean that legacy systems built on PC/104 technology can be upgraded easily, even across vendors. For industrial engineers looking to transition their systems to IIoT readiness, today’s PC/104 peripheral modules offer features ranging from intelligent data acquisition and Wi-Fi connectivity to high-resolution imaging over GbE and more. Below are a few use cases that demonstrate how the compact and rugged PC/104 form factor can be leveraged to quickly add design capabilities. PC/104’s flexible I/O architecture can be coupled with fast processors for high-capture-rate data-acquisition systems. One example is a high-speed camera and frame grabber in which a PCIe/104 card can be used to connect multiple cameras while also controlling the high-speed bus. How? High-speed processing and specific peripheral circuitry can coexist on the same PC/104 board. One PCIe/104 data acquisition I/O card that integrates analog I/O technology with a PCIe interface is the E104-DAQ1616 module from Diamond Systems Corporation. The module supports all data-acquisition functions, including analog-to-digital (A/D), digital-to-analog (D/A), digital input/output (DIO), and counters/timers. The board also supports the PCI-104 connector footprint as an option for communication with PCI-104 cards within existing stacks. Aside from advanced processors, industrial applications like remote surveillance and traffic monitoring demand high-speed video packet streaming. Support for GbE, USB readiness, and low power consumption in the PCI/104-Express and PCIe/104 deliver on these requirements in abundance. The LAN25222HR and LAN35222HR dual-GbE modules from RTD Embedded Technologies provide GbE communications over the PCI/104-Express and PCIe/104 architectures, respectively. Driven by the Intel 82574IT GbE controller, these modules each offer two GbE connections and 10/100/1000 Mbps RJ45 communications on each channel. When deployed in video applications, the RTD boards perform tasks like data offloading and frame grabbing by providing desktop-level performance in a PC/104 form factor. Dual-GbE interfaces, a host of other I/O, and onboard Trusted Platform Module (TPM) make it a potential centerpiece for connected industrial designs that require high levels of data integrity and security. Meanwhile, WinSystems’ PX1-C415 PCIe/104 SBC (Figure 3), based on the Intel Apollo Lake-I E3900 processor, delivers dual GbE and a range of additional I/O through the OneBank expansion. The boards also include a TPM, making it a seamless choice for small-form-factor, rugged IIoT communications systems that handle sensitive data. Wi-Fi is increasingly becoming the communication channel of choice for non-real-time applications in industrial environments like factory floors. Here again, PC/104’s stackable architecture enables designers to seamlessly incorporate Wi-Fi modules or subsystems into existing industrial designs. For instance, RTD Embedded Technologies offers PCI/104-Express and PCIe/104 Mini-PCIe card carrier modules for embedding Wi-Fi functionality into industrial applications: the WLAN25203ER (Figure 4) and WLAN35203ER. Both of these Wi-Fi solutions incorporate Atheros wireless LAN (WLAN) modules that are compliant with the 802.11a/b/g/n standards. Figure 4: Wi-Fi card carriers like the WLAN25203ER (6a) and WLAN35203ER (6b) from RTD Embedded Technologies can boost PC/104 stack capabilities by connecting them to wireless IIoT networks (Source: RTD Embedded Technologies). At this time, when the world of graphics and displays is converging with IIoT designs, x86 processors with powerful CPUs and video-processing capabilities are becoming increasingly prominent. These processors offer more compute performance, higher-resolution graphics, and faster I/Os than previous-generation industrial CPUs while also consuming less power. Figure 5: The Liger EPM-43 from VersaLogic is a PC/104-Plus expansion board that makes it easy to upgrade systems to seventh-generation Intel core processor technology (Source: VersaLogic Corp.). A dense mix of I/O interfaces, wired and wireless connectivity mechanisms, and expansion options in a small form factor continue to enable designers to place PC/104 technology in embedded systems ranging from resource-constrained control systems to high-performance IIoT solutions. By providing support for advanced processors and high-speed interfaces while still delivering on the promise of reliability and long lifecycle operation, PC/104 developers can depend on their investment well into the future. With an architecture that allows industrial designers to quickly deliver more performance and new functionality, there is no need to design new modules, source additional modules, or rebuild entire systems from scratch. For organizations looking to take advantage of IIoT without massive investment or significant downtime, it’s time to get reacquainted with PC/104. 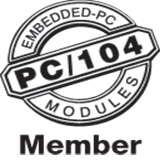 To join the Industrial IoT revolution, visit the PC/104 Consortium at www.pc104.org. Figure 2 | The PC/104 family of specifications has provided a steppingstone to higher-performance embedded systems since 1987. Now, it is enabling these systems to transition to IIoT (Source: PC/104 Consortium).